What the heck is a dead trigger? Let’s define that term first: Anytime you pull the trigger and expect it to go bang, and it doesn’t, that is a dead trigger. If you are in a situation like the one described in the title of this article, it really doesn’t matter why the rifle didn’t go bang, just that you have a response when it does. The article that follows discusses your options. If you have a “dead trigger,” it is due to either one of three things: 1. the rifle wasn’t loaded in the first place, 2. the rifle ran out of ammunition, or 3. you have some sort of malfunction. Common sense would say that if any of these have happened, simply fix the rifle right? Maybe not. Read on. If the rifle stops working, have a plan! The war face is optional. Before I teach you how to reload your rifle or clear any malfunction, I want to discuss the context of the situation and make you think about a few things. Dealing with a malfunction or emergency reload situation requires that the operator thinks about and reacts to what’s going on. The common answer might be to perform a reload as quickly as possible, but let’s consider a few things first. If you happen to be defending your home or maybe you’re a law-enforcement officer and you’re doing a warrant in a house and you’re in a gunfight, when the gun runs empty you’re likely very, very close to the person you’re shooting it out with. If you break the fight down into time, a full reload with an automatic rifle such as an AR-15 or AK-47 platform is going to take you two seconds or more to perform. Clearing a malfunction will take as long or longer. If the person you’re shooting at is within at 20 to 30 feet, this means that they can close the distance and make contact with you well before the reload is done. If they are shooting at you, they can likely shoot 8 or more rounds in those two seconds…all coming right toward your lovely body. Another consideration is when the gun goes dead (i.e. pull trigger and no bang) you may not know exactly what’s wrong with it. You don’t know if it’s a serious malfunction or possibly if your weapon has been shot and damaged beyond repair. A damaged rifle is certainly possible, whether it is from being shot or something simply breaks at that moment in time. I recently broke an extractor on my rifle, and guess what, the rifle becomes a single shot at that time. Therefore in a situation where you’re at room to yard distance (3-20 yards), I recommend strongly that if you’re armed with a handgun you immediately transition to that handgun. This guarantees that you will quickly be able to get rounds on target again. Think about it in terms of time and risk. While a reload with the rifle compared to a transition to the handgun might require very close to the same amount of time, the fact that you have a dead trigger on the rifle does not always mean you can fix it with a reload. Try to pull the trigger on the rifle (this could happen during a series of shots), and get either a click, or nothing at all. 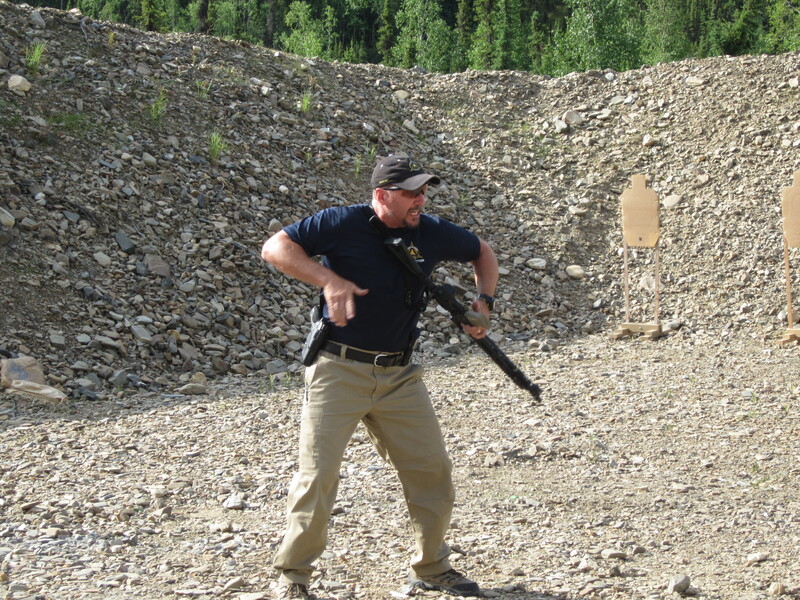 Sweep the rifle out of the way and to your side with your front hand (the one that was on the front handguard/stock) while building the grip on your handgun in the holster. After the front hand sweeps the rifle out of the way make sure it ends up near your chest in a good area to meet the hands together and build a two-handed grip on the handgun. Engage with the handgun as appropriate. See the following photo sequence. Rifle fails to go bang, get it out of the way and use your handgun. Scanning the threat and all areas around you (with the handgun as the primary weapon, remember the rifle is dead). Holster the handgun and fix the rifle. The rifle is now your primary weapon again. Get the rifle back up and into the fight again! So let’s assume that the distance is great enough that transitioning to a handgun is not feasible or you don’t have a handgun to transition to. In this case during the fight when the rifle goes dead your options are to fix it by performing a reload or clearing the malfunction. Additionally, let’s say you’re at a very close range and you don’t have a handgun, you might have to initiate some sort of combatives and strike the threat with the rifle. Another option is to use explosive movement to get to a safer spot like a piece of cover, or at a minimum put distance between you and the threat before attempting to reload or clear the malfunction. One last thought I want you to consider – if you are transitioning because of a dead rifle, that does not always mean you are transitioning to a handgun. Consider your other weapons, such as a knife if you carry one, or possibly your own combative skills like punches and kicks. The point is that you are transitioning to another weapon system; so don’t forget the tools you possess. Train with them! If you are likely to be armed with a handgun when you deploy your rifle, then train the handgun transition as your immediate response. No need to look at the rifle or think about it, simply go to the next weapon system. If the distance and circumstance limits your ability to hit with the handgun, then obviously stick with the rifle and fix it if possible. Set up drills that mimic these needs. For example, practice the transition at distances from 3-10 yards, and set up a secondary drill with a piece of cover (like a barricade) and practice ducking behind cover and reloading the rifle or clearing the malfunction. If you are likely to be armed with a rifle ONLY (like I was during my career in the U.S.M.C) then train yourself to respond accordingly. For example if you are training in the 3-10 yard range, your response to a dead trigger while under fire might be an immediate muzzle strike to the target if you are in range, then a reload. If you are a bit farther away, sprinting offline to another position (like a room or piece of cover) would be your response. So the stimulus response might be: dead trigger – strike the target (0-3 yards) or dead trigger – sprint offline (4-10 yards). In addition, I recommend NEVER training transition drills by keeping the rifle loaded and “simulating the dead trigger.” An example I watched was a group of individuals that were practicing the transition by shooting a couple shots, then flipping their safety on, and transitioning to the handgun (the rifle was still loaded). Two problems with that is that it does not give your brain the proper stimulus to learn (dead trigger), and secondly they were sweeping a loaded rifle out of the way with the potential of having a safety problem if for some reason they failed to get the safety back on. In that case they would have had a loaded, un-safed rifle hanging off their body pointing wherever. Reload option: Set your rifle up with one round in the chamber and an empty magazine. Mount and shoot the rifle (try to shoot twice). The rifle trigger will go “dead.” Transition to the handgun and finish your job, then go through the process of reloading the rifle. After that, set the drill back up again by putting the full magazine back into the rifle. Malfunction Option: Set your rifle up with a magazine loaded with live ammunition and dummy rounds. Practice shooting 1-4 rounds (I call this a progression of 4) and when you get a click (from the dummy round) go through the same transition process. The only difference in this option is that after you have finished your job with the handgun you will have to clear the malfunction on the rifle. If you place several dummy rounds in your magazine, you can practice the drill over and over. And there you have it, the context and thought process behind dealing with a dead trigger on a rifle. Consider your circumstances and figure out how you are going to handle the problem before it happens to you! Great article Mike ! Keep them coming !